In any event, all these “leftist” demagogues, keep poundering that the “rightist” politicians from before are no good, old while ALL of them including evo are in fact old and NO good as well … It is infuriating the way the leftists toy with the language, the way they are the only ones that portray themselves with the truth … the ability they all have to distort reality and confuse the majority of the population who lack knowledge or information about the rampant corruption and ineptitude of evo’s petty government. He came to power in the best possible economic time ever! When I was working with the international cooperation agencies, I started some of the paperwork to condone those loans to Bolivia, well, all those forgiveness along with higher international prices on our exports, gave evo’s opportunity to do something relevant. However he only thought about changing the Constitution, changing our Republic … to his own benefit. What we need is to rebuild our democracy. Have a single candidate to win the 2019 elections and in a matter of three years, restore our credibility, our rights; and then call for early elections, once the masismo is out and imprisoned their corrupt leaders, after a trial, we could again have as many candidates as we would want. This article is being published as part of the partnership between Nueva Sociedad and democraciaAbierta. You can read the original article here. On Sunday, December 3, Bolivians voted to elect the judges of the Supreme Court of Justice, the Agricultural-Environmental Court, the Plurinational Constitutional Court (CPT) and the Council of Magistrates. 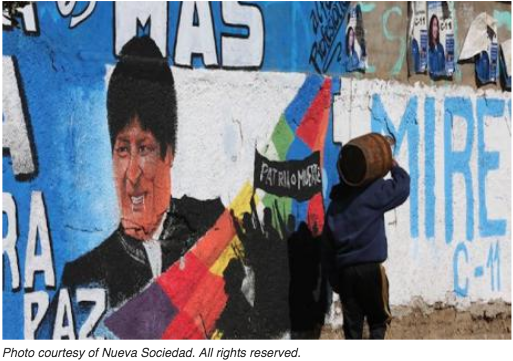 After two years in which the possible re-postulation of Morales for a fourth term had taken up a large part of the political debate, the opposition sought to transform the election into a referendum against the Bolivian leader by calling for a null vote. In the light of the results, the opposition appeared to have achieved its goal, or at least this is what it wished to impress on public opinion when the electoral authority announced that the null votes had passed the 50% mark – to which another 17% blank votes should be added. That is, only about 30% voted for some of the candidates at this judicial election, while most post-election information focused on the slogans against the government on the canceled ballots and the images of the vote count in the cities, where the null vote in many neighborhoods “won” by a landslide . The opposition was quick to celebrate the results, although more through social media than in the streets. Undoubtedly, the sheer number of null votes indicates a serious weakening of a government which, since its re-election in 2014, is clearly lacking in new ideas and falls back on “what has been achieved so far”. The election was marked by the Plurinational Constitutional Court ruling that gives the green light to indefinite re-election. The problem of the ruling party, however, is that in February 2016 Bolivians said “No”, by a narrow margin, to a re-postulation of Morales in a referendum which had been called by the government. So, the government, which is fond on invoking an abstract “national-popular” majority, or the more concrete “social movements”, finds its narrative clashing with the fact that a majority of voters at the referendum refused to grant the President the opportunity to run again. The blow of that defeat – the very first in a twelve-year period in which Evo Morales had won again and again with percentages exceeding 60% – was very hard to swallow and subsequently re-postulation became an obsession for the ruling party. The explanation it gave for what had happened at the polls consisted in referring to an alleged conspiracy by the Right, assisted by the US embassy, detailed in an official documentary entitled The Lying Cartel, in which a number of medium-sized media were accused of spreading a string of falsehoods aimed at defeating the President within the framework of a so-called imperialist “fourth-generation war”. In order to regain the initiative, the government put all its energy into considering a number of potential “paths” to Morales’s reelection, while boosting the discourses stressing the exceptional nature of his leadership. They finally decided on a submitting a request to the TCP, which finally ruled that re-postulation is part of the inalienable right of all citizens, including presidents, “to elect and be elected” enshrined by the Pact of San Jose of Costa Rica. This being so, the article of the 2006 Bolivian Constitution preventing it was, therefore, unconstitutional – given that international agreements on fundamental rights override national constitutions. This argument had already been used in Costa Rica, Nicaragua and Honduras, but had been questioned on one occasion by the Inter-American Commission on Human Rights in a report on former Guatemalan dictator Efraín Ríos Montt, where it recognized that, in the case of presidents, national constitutions can in fact set limits on the right to be elected. Today, the Bolivian government is accused of ignoring popular will. And the president of the Senate, Alberto “Gringo” González, responded to this accusation saying, in a rather controversial way, that the result of the referendum “had already been duly applied” and that this was precisely the reason why the Constitution had not been modified, but interpreted by the TCP. The results of the December 3 judicial elections, in any case, should be handled with care: in 2011, null votes had already exceeded 40% and then Morales was re-elected with more than 60% of the vote. On the other hand, success in calling for a null vote at such an election is fairly easy to achieve, to the extent that a large majority of voters do not know any of the candidates and Justice happens to be one of the most unpopular institutions in the country. The idea of choosing magistrates in a democratic way – and thus “decolonizing” it – is just another good intention issued from the 2006 Constituent Assembly, most of which have led to inoperative institutional forms. And yet, null votes fell short of the sorpasso some sectors were expecting, which comes to explain why the government experienced some relief. This is not to say that 50.02% null votes is not a severe call of attention for the government, which seems too tempted to fall back on its rural bases and is prone to building too many conspiracy theories to explain its problems. Undoubtedly, the exit path it has chosen is based on its belief that a new referendum (the only way to overcome the defeat at the previous referendum without incurring legitimacy costs) would entail too many risks and even some certainty of losing it again. The rejection of the government is now quite evident in the big cities (a rejection that combines democratic arguments against very real institutional deficits with conspicuous doses of social racism, as expressed in social media) and the arguments in favour of re-postulation convince only those who are already convinced. In short: the December 3 results are “good” for the government, which maintains a hard 30% base to try to recover, and “good” for the opposition, which can put up a fight at the polls – the political match remains an open game. The fact that Evo maintains his electoral muscle is not new, what is new is the fact that the opposition is in a position to fight in battles which were unthinkable a few years ago – potentially, that is, for presidential elections are, of course, special. To stand a chance, the opposition needs to build competitive figures capable of facing up to a candidate who remains strong. And Evo Morales can present an economy that, despite the drop in the prices of raw materials, is still showing high levels of growth and consumption – the “Bolivian miracle”. He also controls the State apparatus (which in Bolivia is a decisive variable, especially when the State has financial resources). Additionally, the hyperbolic discourses denouncing Morales’s government as being “worse than the dictatorships of the 70s”, or as deficient as Communist regimes, end up distorting, to a large extent, their goal, which is to highlight the government’s drift towards less pluralism. Morales is looking at Argentina and Ecuador (and even Brazil) to convince himself that the “process of change” depends only on him. But Argentina and Ecuador also show that excessive arrogance, the “criollo sparkle” and falling back on one’s believers, in the long run end up eroding the flags of change and the leaderships which seemed invincible. This entry was posted in Bolivia, Economics, Politics, Social Unrest and tagged corruption in public office, demagogue, democracy in peril, government failures, Ochlocracy. Bookmark the permalink.